Atlantic’s cold water, changes up fishing options. The bottom temperature is cold offshore. Every year we get the cold water that comes in for a few weeks. This will change up the fishing instantly. The fishing is pretty slow in general but there is a few different opportunities that happen only when the cold water comes in. Like Catching Cobia off of the Bull Sharks and also off of the Rays out of the Port Canaveral. The smaller Amber Jacks come in to the 90ft. stuff and just take over. Catching them on Medium tackle can be fun. Inshore- The river is still producing some decent Trout around the Islands and some quiet docks. Early morning with live bait is best chances. There also have been a few decent Snook caught around the docks. The Sebastian Inlet water Temperature has dropped as well. The Snook are really slow. 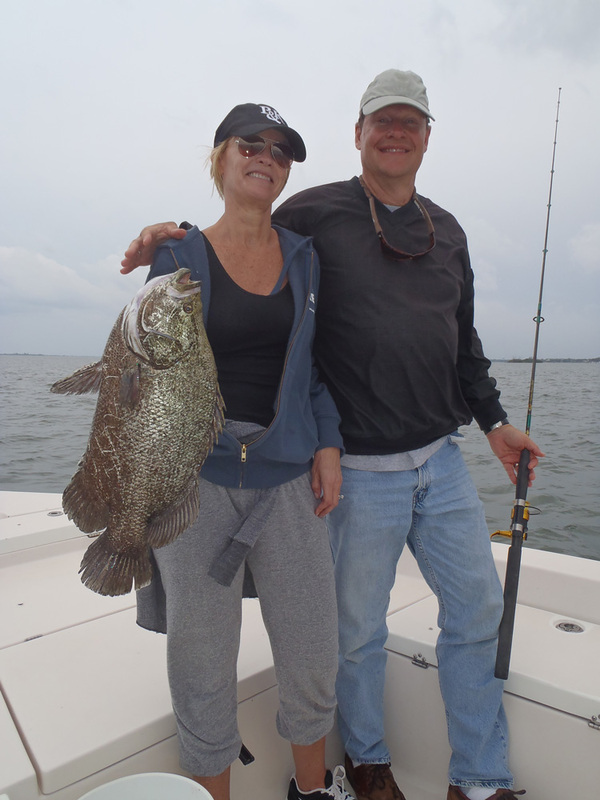 There is and occasional Redfish being caught and a few Jacks. 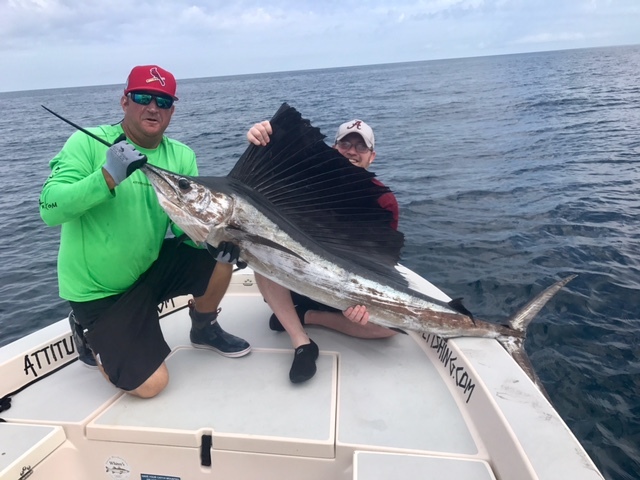 Offshore-with the cold water on the bottom, fishing is slow. But if you can seem to find the Bull sharks then you might be able to catch a few Cobia. The smaller Amber Jacks are thick as well. So if action is what you want then action and tight lines is what you will get. I have had some pretty memorable trips the past two weeks. But I love the Cobia action off of the sharks. It is just mayhem when the fish are with the sharks and behind the boat. It was great to see Bill, who just turned 80 hooking up left and right with Cobia and AJ’s. Thank you very much to Bill and everyone else who fished with attitude lately. It is a pleasure fishing with everyone and I am very fortunate to be your guide. Many memorable moments on each trip. Snook season opens next month and I am already booking dates so book yours soon! 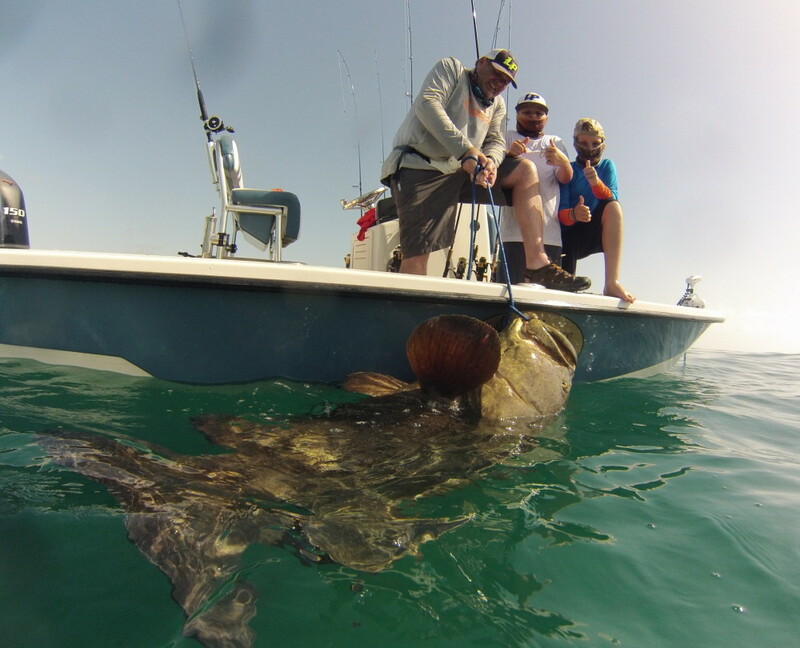 Sebastian Inlet Goliath Grouper. Joe, Jed, and Bryce went fishing with attitude. We started off the morning catching a few crabs and then some Jacks. The Snook bite was slow. Bryce had one on that he lost. Joe wanted to pull on a Goliath so we put a Jack down and it was on with in a few seconds. It took everything that Joe had but he did man up and whipped it down in about 20 minutes. We got some great pics and safely released. After that we went to the wreck to fish for Permit. No luck never seen one Permit. Bryce caught a nice Barracuda. We headed back to the Sebastian Inlet around 1 p.m. Not much happening on the way back. We called it quits around 2 p.m. the tide was switching to incoming when we came in. Thanks Joe for fishing with Attitude again. Hope your not hurting to bad from the beast. Tuesday, 8/19/14 8 a.m. to 3 p.m.
Islam and his friends are from O-town. 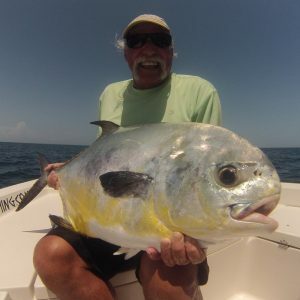 The contacted me about catching Permit. We left the Inlet marina around 8 a.m. The tide was outgoing in the Sebastian Inlet, which made Crabs easy. We headed straight to the spot and passed tons of schools of little Bonita and some Spanish. Once we started fishing Islam hooked up first. He had the fish on for about 10 mins. and was really close to landing it. 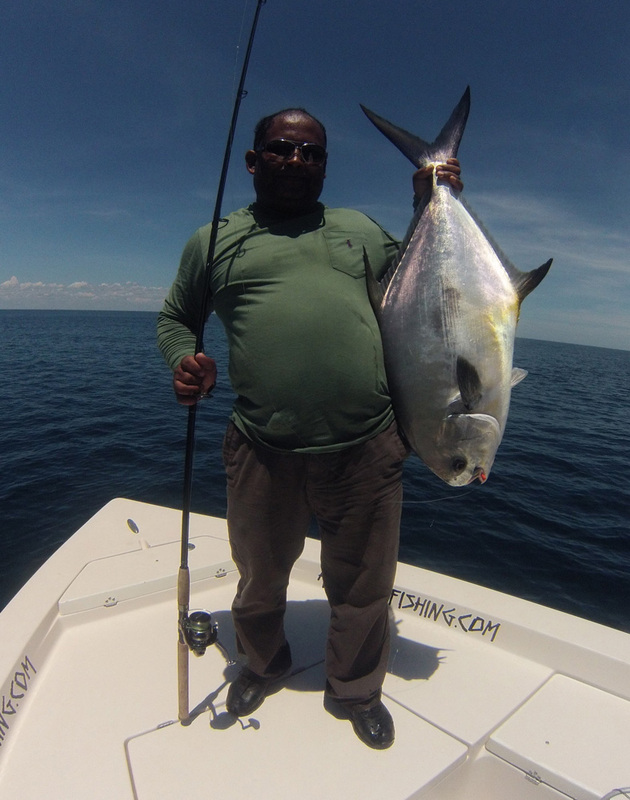 The Permit was big, but it is now a fish story. The bite was a little slow. They managed to hook up two more fish and landed them both. 33lbs. and 24 lbs. Both respectable fish. We looked for the Spanish on the way back to the Sebastian Inlet but no luck. Thank you Islam to you and your friends for fishing aboard the Attitude Adjustment. Hope to see you guys again. Monday, 8/18/14 8 a.m. to 2 p.m. I had a free day so I invited John from Whitey’s and His friend Charlie who was in town visiting. We decided to run and check out if the Permit were still hanging around. The weather was perfect. The tide was outgoing in the morning. Crabs were pretty easy to get. Once we got the spot, things were slow for awhile. I was first to hook up and land a nice Permit. It went 20lb. range. It was pretty slow from then to when Charlie got his bite. He did a great job of fighting and landing his first Permit, the fish weighed 32lbs. It was a solid Permit. He also caught a big Cuda. What a fun day of fishing and not having the pressure. Saturday, 6/29/14 7 a.m. to 2 p.m. The weather was perfect for going offshore. Fishing around the Sebastian Inlet has been a little slow, except for the Redfish on the outgoing tide. We started off cast netting our bait for the day and then headed out to the 60ft. stuff. The first fish of the day was a big Snook that Lleyton caught. Larry got a nice Mangrove Snapper. We caught lots of Seabass and had a few Sharks. As the day was close to ending Lleyton hooked up and landed a nice Red Grouper. It was a fun day fishing with McCaskey Family. Thanks for fishing with Attitude! Thursday, 3-06-14 9 a.m. to 3 p.m.
Michael and Laura are becoming regulars aboard the Attitude Adjustment. It great fishing with them. With the front approaching we were on a strict half day trip. 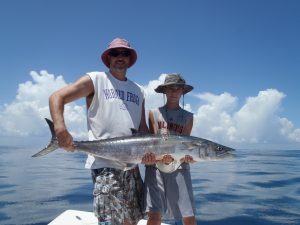 We started off fishing for Spanish Mackerel and Bluefish. They caught there share of both and a few Jacks in the mix. The last hour we went and searched for Triple Tail. We found some weeds close in and found a couple of nice Trips. Michael and his sister Tera each caught a decent Triple Tail. They were each about 8lbs. With the storms approaching it was time to return to the Inlet Marina. Thanks again Michael and Laura, I enjoy fishing with you. Monday, 2-24-12 8a.m. 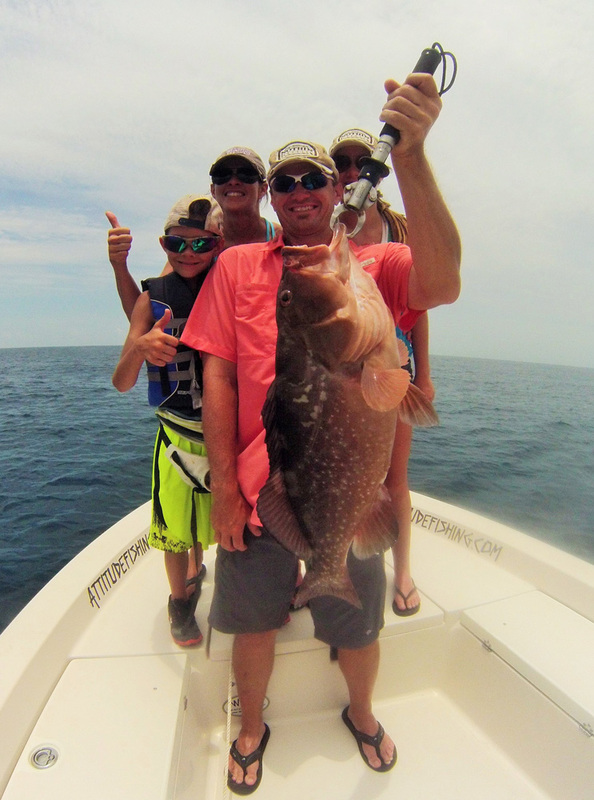 to 4 p.m.
Another great day out of Sebastian Inlet. The weather was great, a light west wind and clear sky. We stayed inside and caught plenty. They mostly fished with a 3/8oz. Attitude Swim Jig. 10 nice Keeper Pompano, tons of Blues, a few Spanish Mackerel, and dozens of Jacks. We finished the day off with a nice Triple Tail. 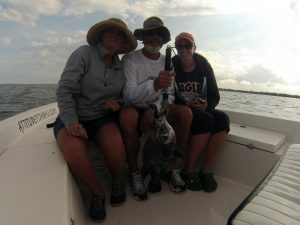 It was pleasure fishing with Keith, Sue, and Meredith, hope to see you guys again! Friday, 6-28-13 7 a.m. to 1 p.m. The beaches are really cold right now. the Surf temp. is 72. Not much happening inside. We headed out to the shoals and did some chumming for Cobia. 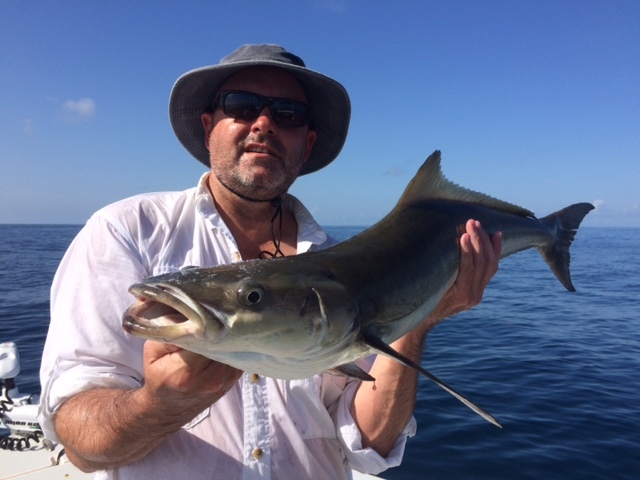 We managed to catch about 5 Cobia. 2 were keepers the other 3 were just short. It was a fun day, the weather was great and the rains held up long enough for us to get back in. Thursday, 8-09-12 9 a.m. to 2 p.m.
Today started off with two flat tires. I had a heck of a morning. Finally around 8:30 I made it to the inlet Marina. I met Richard and his son Nash. They were understanding and still were up for the trip. I netted up some finger Mullet and we headed out. First we trolled just outside the Inlet. The water temp. has warmed back up, but the fishing was still slow. We headed out to some 50ft stuff and quickly hooked up with a decent King. Hopefully the fishing is picking up! 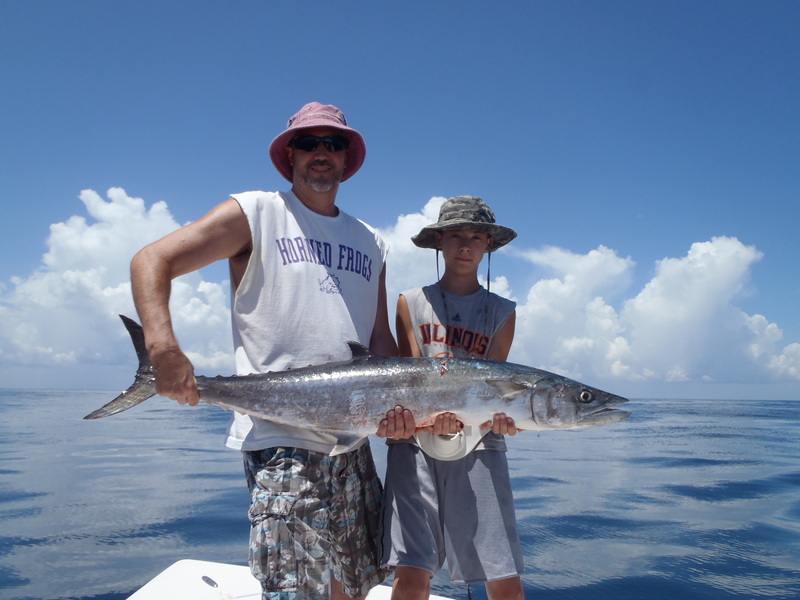 We ended the half day with 3 good kings 12lb.-3olb., 2 Barracudas, plus some that we missed. It was fun and Nash did a great job on the Smoker King. Thanks again Richard and Nash!